The VGA hack uses the Pi’s built-in port for driving a VGA (the vga666 by [Gert]) that we’ve covered before. Keeping in the spirit of the Zero, though, [mincepi] stripped the external components to a minimum. He uses fewer bits, so there is less color resolution. He uses cheaper 5% resistors and solders them directly between the Pi and the VGA board to save a connector (see below). He uses a male connector with the middle pins removed, so it straddles the PCB and plugs into the monitor directly. You can order the boards from OSHPark, or you can make boards yourself. There are even instructions for recycling old VGA cables for connectors if you don’t want to buy new ones. Don’t worry about the rumors that VGA is dead. Vinyl records and tube amplifiers were dead too for a long time, but they still manage to hang in there year after year. This project, by the way, was an entry for the Raspberry Pi Zero contest. Wow, that’s some really clever optimizing. Yes, I agree. And it’s pretty clean. Still can’t believe that article was even conceived. Unlike tubes and records (which have a niche following and audible differences to transistors and digital music), VGA is dead like LPT is dead. There is no reason for it to come back. This type of project happens because someone still has some old monitors, and the computer is cheaper than the display. Aside from refurbishing old tech, VGA will not be making a come back. I don’t miss them, and I don’t miss vinyl. Doubt that will occur with all the environmental hazards that go along with CRTs. The only way I see that is because they will probably be laying around in some old shed or building because it’s such a pain for anyone to take them off you hands for disposal. VGA isn’t only useful for CRT displays. I have a few Dell LCD displays from the mid 2000s that only have VGA inputs. They are perfectly capable displays with no dead pixels or scratches, and this is a great way to get some use out of them. Tell the 6000+ servers in the datacenters I look after in Tokyo about VGA being dead..
Every single server (including all the new ones coming in, even mew models) has VGA out only with no HDMI, DVI or Displayport in sight. Just because consumer motherboards don’t use it, doesn’t mean it’s dead. Absolutely. I work in a DC with about 5000 servers, some ours some colocated. They’re all VGA-only. Try making long HDMI cables to data projectors and billboards etc. and say that again. Like over ethernet…oh. Yeah, HDMI over any length really isn’t a big deal. Wrong. HDMI struggles past 50 feet. I also do projections for shows, the pros still recommend VGA for long runs. Properly shielded no signal loss. I see active mini-HDMI to VGA converters on the ‘bay for under $4 right now. Don’t even need a mini-HDMI to HDMI converter when used on the Zero. Those cheap ebay HDMI-VGA converters can pull up to 300mA. That’s why this VGA connector and the Gert VGA666 (for pi 2b) make sense if you need to hook up a vga monitor. Yes, if you don’t mind losing the GPIO and if 6 bit video is acceptable for the application. Otherwise, just wire up +5V from the GPIO to the converter, and you’re probably golden. I’m just saying that there are other solutions to look at, not that this one doesn’t have its value. Just did buy one of those HDMI-VGA adapters with audio cable for $3 only a couple of weeks ago. Without audio you can find them even for a few cents less. With the 2 PWM channels and a capacitor on the GPIOs, a higher color resolution could possibly be obtained. I believe a 3 control block DMA would do, the first two blocks would use no DRQs, while the third would be paced by a DRQ, set to the serialiser or clock modes. The first block would update the PWM register, and the 2nd and 3rd would control the GPIOs, one for GPIO clear, and the other for GPIO set. With this you could only have 2 of the RGB channels at once at a higher precision, the 3rd would be limited to the lower resolution DAC. You’d need a custom driver to handle your setup and you’d lose the ability to do 3D or video acceleration. The RPi VGA output uses the built-in DPI peripheral. You can do 3D by reading back from the frame buffer after drawing 3D into it, and the frame rate would definitively suffer. But yeah, you would be much better off using built-in peripherals. I hate to be that guy, but a turnkey adapter is less than $6 on Ebay, and the ones I use work fine, so the money argument is a little thin. I was aware of the $6 adapters before I started. This project is actually part of a larger one to reduce the cost of a computer to the absolute minimum. The idea was sparked by a comment by a high-school coding teacher that the Zero was cheap enough to give to one to each student. Of course it isn’t usable without a bunch of accessories. And some students can’t afford much, so a few dollars matter. 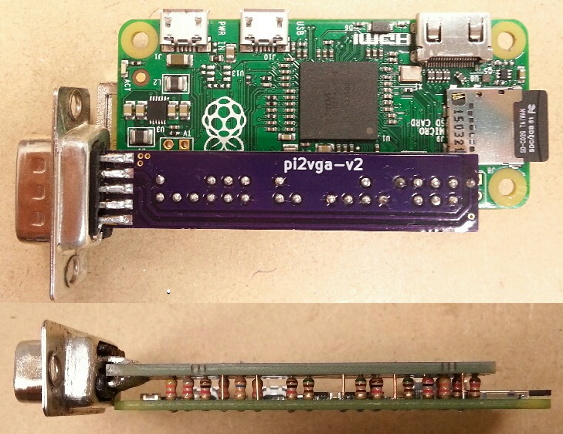 I’m hoping to use Rpi WiFi project (also submitted to the contest) to get WiFi without using the USB port. Then I can use a PS/2 keyboard and USB mouse to finish it off. I think it’s a great project, Everyone has reasons for doing things that others wouldn’t find useful. That is what hacking is all about. Making things do what you want, Not what others think is good or useful. Has anyone gotten any further on using the Raspberry Pi as a VGA-based SDR ??? do you mean exploiting vga666 port ala Fabrice Bellard http://bellard.org/dvbt/ ? If only there was a budget method of doing this with UHF freq. Commercial solutions are a lot of money. If you use the hackrf I would use the gruradio DVB-T2 code, the performance is much better compared to DVB-T. Wow!! !This is nice. That’s some really clever optimizing. This is only a passive cable. It won’t work on the pi. I’ve bought a $2.61 active one from ebay. Just waiting for it to arrive from HK. Specifically for using on the PI. I don’t have the time to do the VGA resistor hack when the alternative is so cheap, but I respect the project goals. The custom driver is a shame, but giving something back for legacy is nice. A zero with this would be great as there are so many cheap & free older LCD monitors around. 14″ 1024×768 can be found all day long in the right places. huh? Are comments deleted here? That trick with the resistors in between the boards is neat, I don’t think I’ve seen that before. Looks like a nice, clean solution if you need VGA on the Zero. How much cpu usage is required to get a normal output on screen. definitely looks quite nice, but isnt the gertvga from thepihut.com (uk) just 6$? Thanks. That is very cool!